Families spend a great deal of time together and it is up to parents to determine just how that time is spent. Since it is so important for children to develop healthy habits parents should utilise the time that they spend with their kids encouraging exercise and active play. Activity and exercise are important for both physical and emotional well being, so teaching children to be active can help them to live well in both the short and long term. Starting the day with a brisk walk gives family members a chance to ‘charge their batteries’ and begin their days feeling invigorated, which can help to energize and encourage further activity. 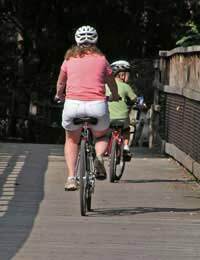 Evening walks or bike rides are great for families too, giving them the opportunity to catch upon each other’s day and relieve any tension from the day’s responsibilities, promoting emotional well being and sound, restful sleep. People today often feel overburdened with work, household, and family responsibilities, but it is important for parents to carve out regular blocks of time for active family fun. Waiting for some magical time to arrive when life seems simpler and schedules are less pressing is a recipe for failure when it comes to family bonding. Even if it means eliminating other commitments, making the decision to prioritize family activities will benefit every family member. Games and activities do not have to be full day events; it is just as helpful to find regular time slots of even 30 minutes, squeezing in a game of tag after school, a walk through snowy streets, and maybe an indoor dance competition. Parents can take cues for their kids as to what activities they’d find most enjoyable and should try to be flexible about trying new things. Since kids of different ages might not always prefer the same types of activities, it can be a good idea for family members to alternate choosing the game or outing. Visits to zoos and museums provide healthy walking time, but short jaunts to local parks to play on climbing frames and swing on the swings may be preferable when time is limited. Many families find that when they get away from the pressures of everyday life, they are more likely to relax and enjoy playing together. Scheduling active holiday getaways can help family members to remember how much fun that playing together can be. Camping, hiking, all terrain biking, skiing, sailing or horseback riding are all options for having fun together while helping to build healthy bodies. Even weekend getaways can help families to remind themselves of the importance of playing together, hopefully then incorporating fun, together time into their regular lives.